Today, we released an updated version of iOS Forensic Toolkit. It’s not as much of an update to make big news shout, but the number of improvements here and there warrants a blog post, and is definitely worth upgrading to if you’re dealing with multiple iPhones on a daily basis. 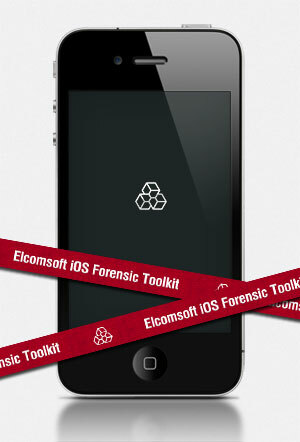 The newly updated Elcomsoft iOS Forensic Toolkit now supports iOS 5.1 and adds a number of small and not-so-small enhancements to the already sound package. The ability to try top 100 most common passcodes gives a chance to recover a passcode in a matter of minutes. There’s one more thing new with the updated iOS Forensic Toolkit: an iPhone booted with iOS Forensic Toolkit now displays a small ElcomSoft logo instead of the default one. We’ve seen lots of iPhones. Most are locked with simple, easy to remember passcodes. We were able to compile a list of most commonly used passcodes. There are the obvious ones like 1111, 2222, 1234, 5555, vertical raw 2580, and there are many ‘convenience’ passcodes that are just easier to remember or enter on the iPhone’s screen. There’s a whole range of passcodes representing possible dates significant to iPhone owners; these passcodes range from early 1930 to 2020. The updated iOS Forensic Toolkit will now try these passcodes before launching a brute-force attack. How good are the chances? A recent study demonstrated that as many as 15% of all passcode sets are represented by only 10 different passcodes (out of 10,000 possible combinations). That’s 1 in 7 iPhones unlocked within minutes or even seconds. We also added a few other improvements and enhancements here and there, making the new version a recommended update.